For the 2007 Plan update, TischlerBise, Inc. was contracted by the City of Dublin to conduct a fiscal impact analysis evaluating the overall aggregate impacts of land use scenarios projected to the year 2030, as described in Land Use. The analysis summarized the fiscal impacts of future population and employment growth within the City of Dublin and in potential annexation areas, primarily to the northwest. All results are those accruing from new growth only, and do not include costs and revenues from the existing population and employment base of the city. 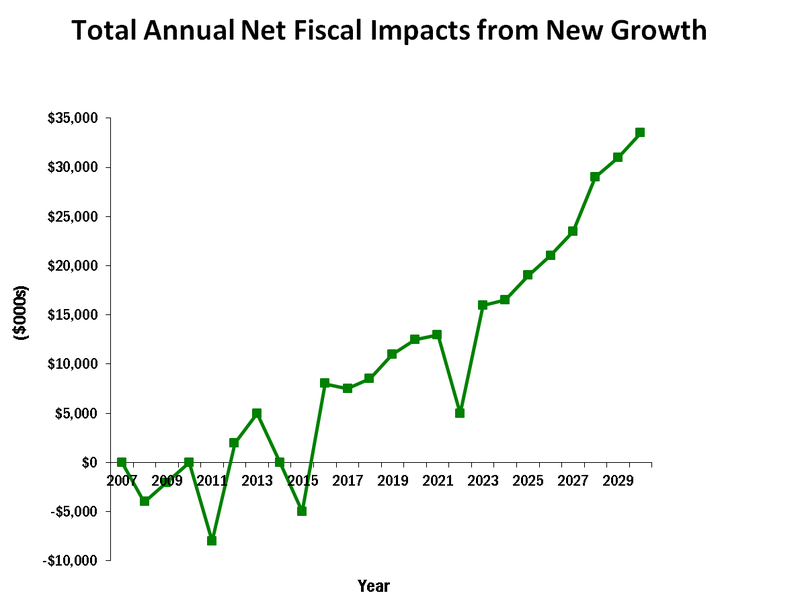 This fiscal impact analysis was used to determine whether revenues generated by new growth would be sufficient to cover the costs to the city generated by that growth. It should be noted that a separate fiscal impact analysis is being conducted as part of the Bridge Street District planning initiative, the completion of which is anticipated in mid-2013. Also performed by TischlerBise, the methodology used in this analysis is consistent with the 2007 study. While a fiscal impact analysis is an important consideration in planning decisions, it is only one of several issues which should be considered. Non-fiscal issues such as the environment, housing affordability, jobs/housing balance, traffic and quality of life must also be considered. The above notwithstanding, these analyses enable interested parties to understand the fiscal implications of future development. The fiscal impact analysis uses three types of input data. The first category of demographic and economic projections is called Demand Base data inputs. These numerical projections include data such as population, housing units, employment, and commercial and industrial space. The second category of input data focuses on property taxes. Market values of residential and non-residential property in the City of Dublin, expressed in constant current dollars, are multiplied by the current tax rate and assessed value to calculate property tax revenues for new development (for both operating and capital facility purposes). The market values are based on new residential and non-residential development data. The third type of input data relates to government service levels, costs and revenues and is used to calculate the annual costs, revenues and capital facilities by city department or function, where appropriate. A fiscal impact analysis determines whether revenues generated by new growth are sufficient to cover the resulting costs for service and facility demands placed on the city as a result of that growth. The fiscal impact analysis conducted by TischlerBise incorporate the case study-marginal cost approach wherever possible. The case study-marginal methodology is the most realistic method for evaluating fiscal impacts as it takes site or geographic specific information into consideration. Therefore, any unique demographic or locational characteristics of new development are accounted for, as well as the extent to which a particular infrastructure or service operates under, over or near capacity. Therefore, available facility capacity determines the need for additional capital facilities and associated operating costs. Many of the administrative/general government costs that are impacted by general growth in the city, regardless of location, are projected using a marginal/average cost hybrid methodology that attempts to determine capacity and thresholds for staffing but projects non-salary operating costs using an average cost approach. As a first step in the analysis, levels of service are evaluated along with cost and revenue assumptions. These assumptions are based on interviews and discussions with department heads, their representatives, and other related personnel in addition to a detailed analysis of the city’s adopted budget. The revenue and cost projections are based on the assumption that in most cases the current level of spending, as provided in the budget, will continue over time. Costs and revenues that are directly attributable to new development are included in the fiscal impact analysis. Some costs and revenues are not expected to be impacted by demographic changes, and are considered fixed costs and revenues. To determine fixed costs and revenues, TischlerBise reviewed the City of Dublin budget and all available supporting documentation. Funds evaluated as part of this analysis include the city’s tax supported funds. Based on this review, preliminary assumptions were developed and were reviewed and discussed with appropriate City department representatives. In some cases, a determination was made based on TischlerBise’s national experience conducting public sector fiscal impact analyses. The current level of spending is referred to as the current level of service and is used to calculate the fiscal impact to the city for the fiscal analysis period. Current demand base data is used to calculate unit costs and service level thresholds. Examples of demand base data include population, dwelling units, employment by type, vehicle trips, etc. Current constant dollars are used throughout the analysis period (current dollars are set at 2007 dollars based on the completion during the 2007 Plan update). Certain special revenue funds, such as the Cemetery Fund, are not included in the analysis because revenues generated from such funds are assumed to be fixed and unrelated to growth. Enterprise Funds (i.e. sewer and water) were not modeled because the intent of the fiscal analysis is to include only tax supported funds. Furthermore, improvements associated with water and sewer are excluded because these areas have separate rate structures established by the utility provider. These rate structures are updated annually. Revenues are projected assuming that the current revenue structure and tax rates used in the preparation of the City of Dublin budget would not change during the analysis period. The rate of inflation is assumed to be zero throughout the projection period, and cost and revenue projections are in constant dollars. This assumption is in accordance with current budget data at the time of the analysis and avoids the difficulty of speculation about inflation rates and its effect on cost and revenue categories. It also avoids the problem of interpreting results expressed in inflated dollars over an extended period of time. Two of the three land use scenarios described in Land Use were evaluated in the 2007 fiscal analysis. Based on policy direction, adopted land use principles, relative traffic impacts, expected employment demand and public input, the Mid-Range Scenario was chosen for analysis alongside the Trend Scenario. The results indicated that development according to the Mid-Range Scenario, which emphasizes employment growth and a balanced mix of commercial and residential uses, will provide a more fiscally viable alternative for Dublin as the city approaches build-out. While the population increase projected under both scenarios is similar, increases projected under the Mid-Range Scenario are distributed relatively evenly across the fiscal analysis zones, thus distributing the burden of supplying services for the residential base throughout new growth areas. The employment difference between the scenarios is very large, with the Mid-Range Scenario having more than twice the amount of new jobs than the Trend Scenario. The office sector is responsible for a majority of the increase in new jobs and non-residential square footage. 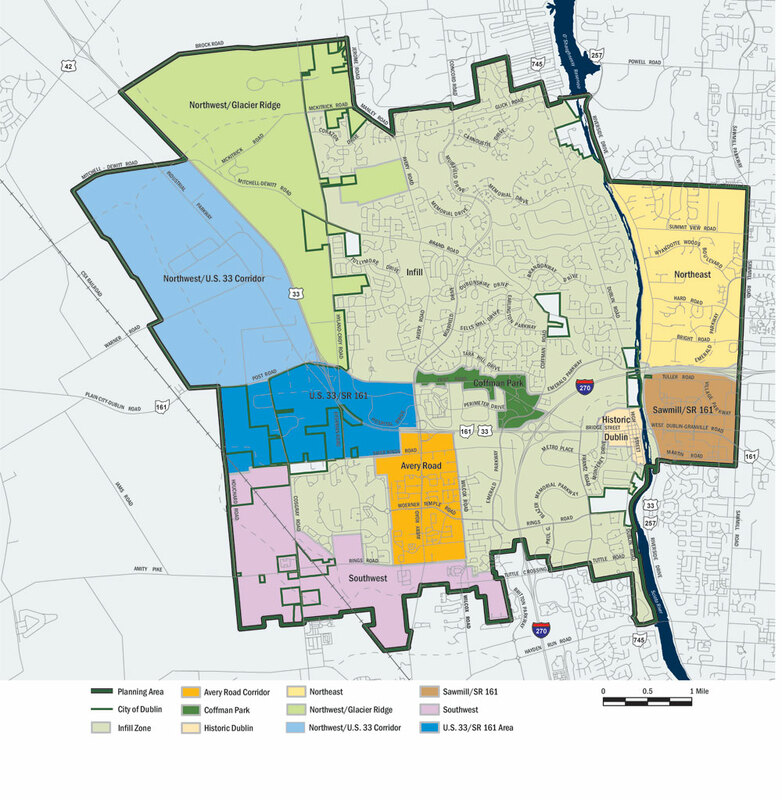 As described in Land Use, the Mid-Range Scenario was ultimately chosen as the basis for the 2007 Land Use Plan, which is now updated to include more recent planning efforts for the Bridge Street District. This zone is defined by the Dublin corporate boundary. The fiscal modeling for this zone assesses the impacts of new growth only (including redevelopment) and does not include existing development. Approximately 745 acres are located along Avery Road within Dublin, stretching from the U.S. 33 interchange to Rings Road. This zone includes a mixture of existing residential, office and light industrial uses. This area was modeled with a mixture of residential, neighborhood-level retail and office uses at the intersection of Avery Road and Woerner Temple Road, as well as a mixture of office, research & development and light industrial uses at the Avery Road/Shier Rings Road intersection. This zone includes approximately 250 acres along Post Road within Dublin, stretching from the I-270/U.S. 33 interchange to Avery-Muirfield Drive, and includes portions of Emerald Parkway and Perimeter Drive. This zone incorporates the Coffman Park expansion area between Commerce Parkway and Emerald Parkway. The area was modeled to include office development on land bounded by Emerald Parkway and the interchange. Approximately 140 acres are located in the center of Dublin at the intersection of High Street (Dublin Road) and West Bridge Street (U.S. 33/SR 161). This zone includes a wide range of residential and commercial uses as part of a key village center within the City. Historic Dublin was modeled with a focus on mixed use infill and redevelopment, including retail, office, residential and civic uses. Approximately 1,620 acres lie within Dublin and are bounded by I-270, Sawmill Road, the Scioto River and the Dublin Corporate boundary. This area is predominantly residential and includes a variety of retail and office uses along Sawmill Road. The Bright Road portion of this area was modeled for a mixture of freeway-oriented office uses along I-270 and the future extension of Emerald Parkway, as well as a mix of residential and neighborhood-level office uses. This zone includes a potential redevelopment area at the corner of Sawmill Road and Summit View Road, also modeled as a mixture of residential uses and neighborhood-scale offices. Approximately 3,000 acres are located between Dublin’s northwest boundary (generally along Hyland-Croy Road) and U.S. 33, south of Brock Road. Small portions of unincorporated land are within Dublin’s Exclusive Service Area, although the majority of this zone is located in the Negotiated Service Area. Portions also fall within the City of Marysville service area. A large portion of this zone has been preserved as the Glacier Ridge Metro Park. This area was modeled with a focus on cluster residential (i.e. conservation design) development in the vicinity of the Metro Park, and a mixture of residential, research and development and office uses near the Post Road/U.S. 33 interchange. This analysis area includes approximately 2,550 acres to the northwest of Dublin, bounded by U.S. 33/SR 161 (Post Road), Mitchell-Dewitt Road and Kile-Warner Road. This zone is located entirely within the Negotiated Service Area, and also falls within the City of Marysville utility service area. The zone includes existing light industrial uses and other types of commercial uses, but is largely undeveloped. The area is accessed from U.S. 33 via an existing interchange at SR 161 (Post Road), which is planned for major improvements in the future. A new interchange at McKitrick Road is included in the City’s Thoroughfare Plan, and the future extension of Houchard Road will provide additional access to this area. The area was modeled for a mixture of office, light industrial and research uses, along with a series of mixed use retail/commercial centers with residential support. Approximately 635 acres are within Dublin, bounded by I-270, Sawmill Road, Martin Road and the Scioto River. This zone includes existing and planned residential, retail and office development. Modeling included a substantial mixed use town center in the eastern portion of this zone, accessible via the I-270/Sawmill Road interchange, and supported by office and high density residential uses. Approximately 1,700 acres to the southwest of Dublin includes a mixture of incorporated and unincorporated land. The majority of this area has been annexed into the City. Unincorporated portions are within the Dublin Exclusive Service Area. This zone includes the Village of Amlin, located along the CSX railroad line and at the intersection of Cosgray Road and Rings Road. The future extension of Tuttle Crossing Boulevard to Houchard Road will provide additional access to this area, which is planned primarily for residential development. The area was modeled for office uses along Avery Road and mixed use commercial/residential developments along Tuttle Crossing Boulevard and in Amlin. Approximately 1,320 acres are bounded by U.S. 33/SR 161, Avery Road, Shier Rings Road and Houchard Road. Unincorporated portions of this zone are located within the Dublin Exclusive Service Area. The zone includes existing office and light industrial uses, but is largely undeveloped. This fiscal area is adjacent to the U.S. 33 Corridor Zone and was modeled for a mix of office, research and light industrial uses within the city’s West Innovation District. As part of the 2013 Bridge Street District Fiscal Impact Analysis, it is anticipated that the Historic Dublin and Sawmill/SR 161 Zones will be replaced with a Bridge Street District Zone. This zone will be defined by approximately 1,000 acres bounded by I-270 and Sawmill Road, including land immediately to the south of SR 161. The zone includes existing office and retail uses, and a limited amount of existing residential. The combined zone includes additional land that was not previously identified for redevelopment in 2007. This fiscal area is modeled for high density, mixed use urban development, including a variety of residential, office and commercial uses. Average annual net fiscal impact (revenues minus expenditures) is illustrated in the tables below. The fiscal results include both operating and capital impacts. All results are those accruing from new growth only, and do not include costs and revenues from the existing population and employment base of the city. Projected development according to the 2007 Land Use Plan generates average annual net surpluses in all time periods. Average annual net surpluses are generated in Years 1-10 due to the additional income tax resulting from employment growth. Those surpluses are modest, however, because five of the fiscal analysis zones are adding park facilities to accommodate residential population growth during the period. There are large contrasts between Years 1-10 and 11-23 because more of the office sector employment is projected to develop in the latter half of the analysis period. This demonstrates that the city will be able to offset its capital and operating costs from new growth areas by emphasizing office development, the highest income tax revenue generating employment sector. Development according to the 2007 Land Use Plan is projected to generate $817.5 million in cumulative income tax citywide. 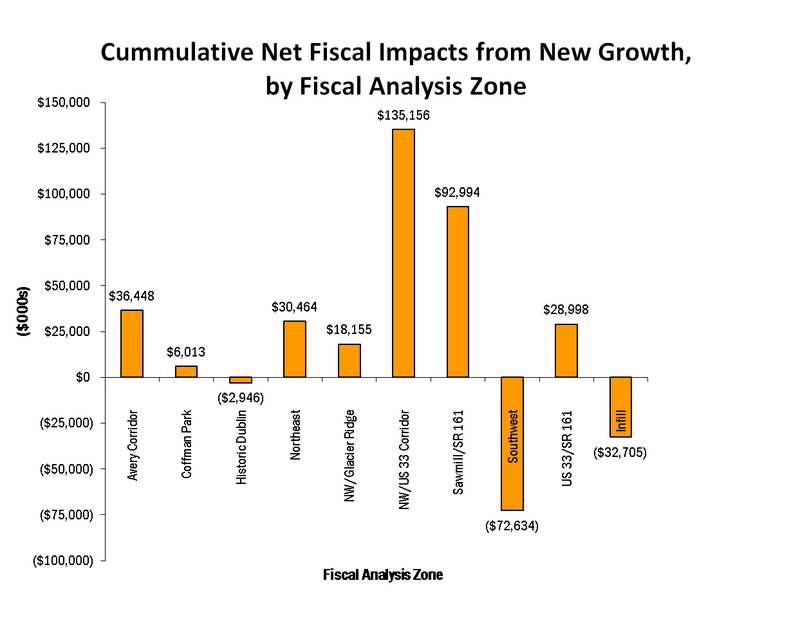 The figure below shows the annual net fiscal impacts to the city over the analysis period. By showing the results annually, the magnitude, rate of change, and timeline of deficits and surpluses can be observed over time. Data points above the $0 line represent annual surpluses, while points below the $0 line represent annual deficits. The irregular nature of the annual results during particular years represents the opening of capital facilities and/or major operating costs being incurred. Increasing annual net surpluses are projected for a majority of the years; primarily due to the amount of income tax revenue the city receives from the higher employment projected for the latter half of the analysis period. The sharp downward spikes in data are the result of new park facilities being constructed, reflecting pay-as-you-go financing for the development of each park. The figure below illustrates the cumulative net fiscal impacts to the City of Dublin for the operating and capital budgets as well as the combined net impact. The cumulative impacts are the total amount of money lost or gained over the analysis period. 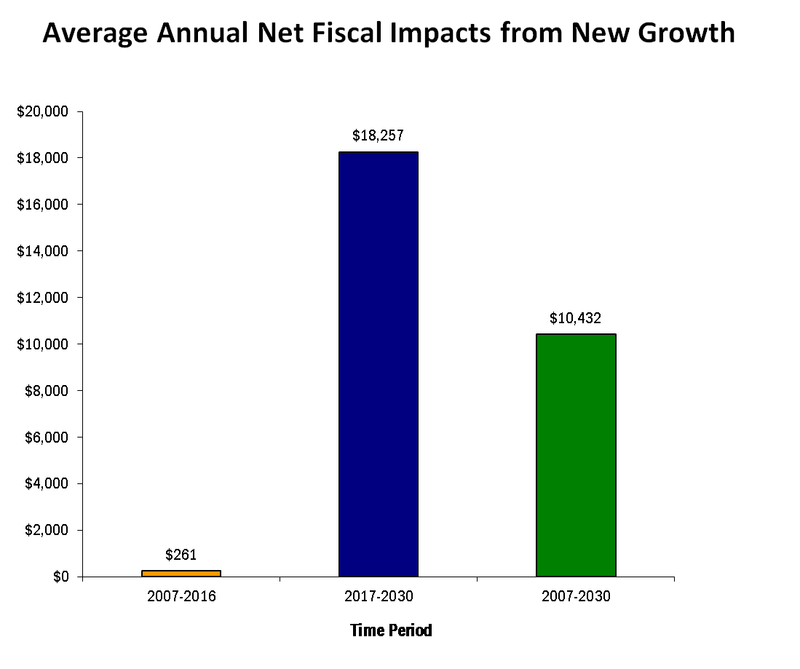 As the chart indicates, a cumulative net surplus of $239.9 million is projected. The chart shows that the city will be able to handle the operating costs incurred from new population and employment growth, as a surplus will be generated for the operating budget. Net deficits are generated in the capital budget because of the costs incurred primarily from road capacity projects and additional park construction. However, the city will be able to cover the deficits incurred by the capital budget because of a larger surplus in the operating budget. 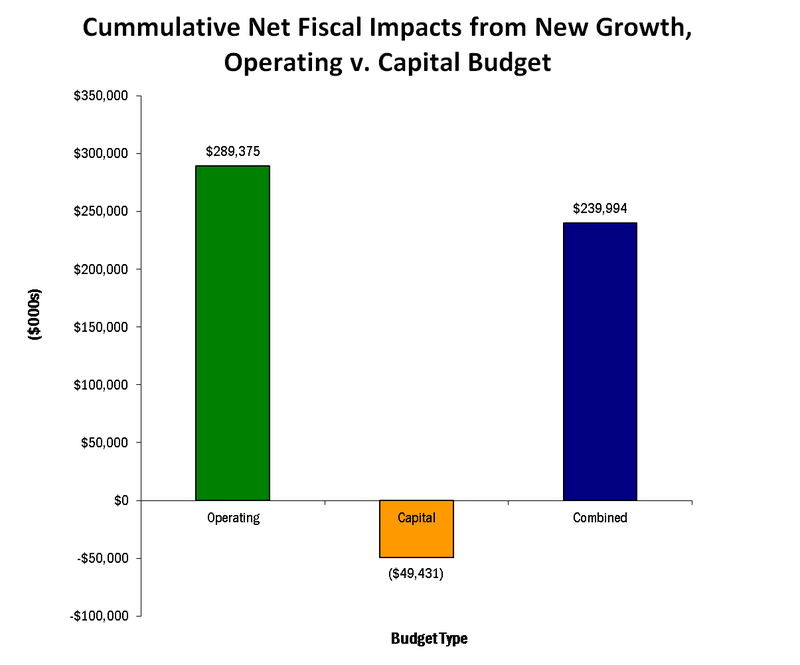 The figure below illustrates the cumulative net fiscal impacts (combined net impact of the operating and capital budgets) to the City by fiscal analysis zone (FAZ). The cumulative impacts are the total amount of money lost or gained over the analysis periods. In this analysis, road capital facility costs are allocated to the zone for which they are planned. Citywide capital facility costs are also allocated according to the proportion of new growth projected in each zone. The majority of net surpluses are generated from the Northwest/U.S. 33 Corridor and Sawmill/SR 161 FAZs, which have the first and third highest employment increases, respectively. The City will be able to offset the large costs of road infrastructure in the U.S. 33/SR 161 Zone (associated with the planned US 33/SR 161/Post Road interchange improvement) with more employment, mostly in the office and research and development sectors. Two zones are expected to generate deficits, primarily due to an emphasis on residential development. This analysis reflects the projected cash flow to the city. The forecast reveals annual net surpluses throughout the majority of the analysis periods. It is important to note that the citywide analysis is based on maintaining existing levels of service as defined by the FY2007 Budget. If the city is not be able to capture the office sector employment projected or if the residential base is greater than expected, there will be a reduced surplus or possibly net deficits. Capital costs and employment are the major drivers of deficits and surpluses. If an area has a large residential base and a small employment base then it will most likely incur deficits due to demand for services by the residential component and a lack of income tax revenue from the employment base to cover this demand. The office sector will generate the most income tax revenue of the three sectors considered; the other two components are industrial (second highest) and retail (last). Uses can have a profound effect on creating surplus in a zone, and the cost to serve the retail sector alone with police and other services outweighs income taxes generated from this sector due to lower-wage service jobs. Target areas with a high proportion of retail jobs relative to the other two employment sectors will generate net deficits. Retail uses, however, should be viewed as a quality of life factor that surpasses defined geographies for fiscal analysis. The fiscal study assumes that certain capital costs will be debt financed. This assumption enables policy makers and city staff to discuss financing options and trade-offs regarding “pay-as-you-go” versus debt financing as it relates to operating and capital needs. For instance, the timing and location of population increases will trigger certain capital facilities (such as parks) to be built at certain times. This creates the need to pay all the development costs for the parks at the time of construction and to debt finance the acquisition costs for community parks as necessary. Net deficits are larger in the first half of the analysis period for the Trend Scenario primarily due to the development cost incurred by the Southwest Zone for park facilities, the compounding nature of debt service payments for growth-related capital improvements, and a lack of employment to cover the costs. This same effect is not as drastic in the Mid-Range Scenario because the increase in income tax revenue from more employees helps to offset these capital improvement costs. Transportation improvement projects represent the largest capital expense over the development periods for the scenarios. The projected addition of over 40,000 more employees will generate higher income tax revenue to help offset the major expenditures for road improvements. Police, Street Maintenance, and Parks represent the largest growth-related operating expenses for the city. Economic Development is the fourth largest growth-related operating expense; however, this category is projected using jobs (as opposed to residential population) because it is directly related to the city’s ability to attract new businesses. If the city is successful in its efforts to increase its presence as a regional employment center, the present revenue structure will be sufficient to provide current levels of service to new development. New growth generates net surpluses to the operating budget in the City of Dublin. This is because the city’s revenue structure is heavily reliant on income tax and the city is fortunate to have a high employee to resident ratio. This is important in Ohio because most municipal revenue is derived from income tax rather than property tax. The current city population and employment base generates revenue that exceeds costs in the current budget. This surplus generated by the city’s existing development base is due to economies of scale that exist with current infrastructure as well as staffing capacity. Expansion into areas outside the city’s present built environment creates the need to expand infrastructure and potentially to hire additional staff. Road construction is the primary source of all expenses generated by the city. It amounts to 30 percent for the Mid-Range Scenario (including both operating and capital costs). Many of the same road improvements are identified and projected under both scenarios in the 2007 analysis, but have different cost implications. Development according to the Land Use Plan will generate more employment, population, and housing units in addition to more vehicle trips per year due to increased employment, resulting in increased economies of scale to fund the improvements. The city will benefit by encouraging higher density residential and mixed use development in targeted planning areas. The Land Use Plan places greater emphasis on alternative housing units, as well as mixed use and clustered residential development patterns that will enable the city to lower residential road frontages required for new development. The lower road frontage means the city will have less street surface to maintain despite having a higher population and more housing units.